TV sales are here. What is DVB-T2 and how to choose the right one? The times when the televisions were divided into black and white and colored, or later on those without the driver and the driver, are irretrievably gone. You will find a large selection of TVs in the market where it is not easy to orientate. The functions of the TVs are getting wider and they may no longer be just a TV receiver. If you've decided to take advantage of January sales and get a new model in your home, we've got some basic tips for you to choose from. Obsolete TVs, which primarily occupied a lot of space, replaced plasma TVs first. They are also on the decline, and instead they have come up with modern and more economical LCD panels and LED TVs. The top among today's TVs are OLED or QLED TVs that have even more faithful color rendering, deeper contrast, brightness and economy than "classic" LED TVs. On the other hand, these televisions are too costly for most people. As for the appearance of television, in addition to classic flat-screen TVs, you can now find a curved TV that will keep the viewer's relative distance from all the screen points. However, this TV is not suitable for more viewers watching television from different angles. Our tip: Television is a costly investment for a long time, so choose not only the device itself, but also the method of financing. "Some electronics vendors, for example, offer a so-called Pagodil as part of a resale sale, which makes the APR, the total cost of the loan, 0%. You do not pay for anything, you just split the prize in several parts, "says Cyril Křupal of Cofidis. In addition to the type and appearance, think about selecting TV as well as its practicality and usability in the future, which is mainly related to the tuner. In the Czech Republic, only digital signal is now available (compared to the original analogue). Today, there are three basic types of television broadcasting. DVB-T, the current standard of terrestrial broadcasting, and this tuner is part of commonly-sold TVs. In addition, DVB-C cable, support for this broadcast is also a tuner standard in TV receivers. A satellite broadcast (DVB-S) that requires a satellite antenna or a satellite tuner embedded on television. Our tip: The future standard of digital terrestrial broadcasting is called DVB-T2. It enters the scene in 2021 and replaces the current DVB-T broadcasting standard. Set-top boxes and older televisions are unfortunately unable to process these data, so new models that support DVB-T2 terrestrial broadcasting today need to be selected today. The main benefit of this broadcast will be the higher the number of stations of higher quality. Letting yourself dazzle with a huge diagonal is a fairly common mistake. You should choose the optimal size of the TV based on the resolution and the distance from which you intend to watch the broadcast. For older standard definition TVs or HD Ready, the optimal viewing distance should be three times the size of the diagonal. 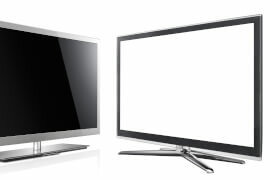 LCD TVs with higher resolution Full HD are about 2-3 times higher. For devices with 4K Ultra HD, there is nothing to optimize for the optimum distance. On such a television you can watch from a distance of 2 meters without spoiling your eyes while enjoying the best quality. And now even a TV with an even higher resolution of 8K appears. Our tip: The manufacturers are giving the size of the diagonals in inches. 1 inch = 2.54 cm. So, if you want to monitor the LCD from a distance of 2 m, you should choose a 40 "diagonal (102 cm) diagonal. You can currently choose from a 16" (41 cm) to 88 "diagonal (224 cm) diagonal. Last but not least, when choosing a new TV, think about the fact that today's devices are no longer just for passive watching television. The "Smart" TV lets you view content to connect with the Internet. You can watch online shows like HBO or Netflix, get on Facebook or Skype, or you can easily view your mobile phone content. Our tip: If you want to avoid a lot of unsightly cables to connect to the Internet, be sure to have your new TV equipped with Wi-Fi. Modern TV connectors can be connected to anything from external drive, camera, to game console. That is why you need to think of enough free connectors. Alternatively, verify the possibility of using wireless devices to use the device. Functions - such as USB or PIP recording. With the first feature, you can record a TV show either on a flash drive or on an external hard drive. The second feature lets you watch an image from two sources on one screen so you can take the second channel you are interested in in a dimmed window. Control - TVs can now be operated not only by the remote control directly in the package. You can also connect to a smart mobile phone. Some drivers are now even equipped with a touch pad or keyboard that facilitates eg internet access. The one who loved you is the film of this Christmas!